Michelle has been performing for over twenty-five years. She is an actor, professional puppeteer, professional speaker, voice-over artist, singer, song writer, and playwright. She has performed on stages as far as Yorktown Heights New York and Jakarta Indonesia. 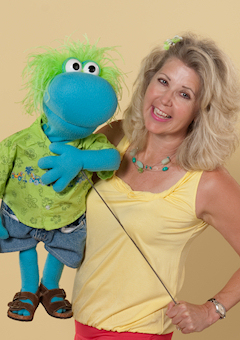 She has written and performed puppet musicals for over ten years. Michelle was the Calgary Block Parent Educational Program Manager for two years, writing and performing safety programs in Calgary schools to raving reviews from teachers and students. She has worked with children from ages 2 to 14 years, with and without disabilities. She has volunteered in orphanages and schools in Tanzania, Brazil, Indonesia, and Calgary. She has entertained for festivals, corporations, fundraisers, shelters, and special occasions, and was MC for The Calgary Immigrant Educational Society’s 20th Anniversary Celebration, proudly introducing a number of local and provincial politicians. Michelle believes in perseverance of one’s dream no matter what age, what ability, or life experience, and knows that we are our truest self when we are able to play and be totally present in the moment.